After a year of preparation, JN editor Meagan DeLisle got her second chance to ride in a George Morris clinic. Would her luck turn around in 2018? If you missed last year’s accounts, catch up HERE. I woke up this morning to the sound of rain pitter-pattering on our hotel window. Despite my thousands of prayers for good weather this weekend, Missouri had neglected to oblige. Today was the first day of my redemption rides throughout the three-day George Morris clinic at Altamontè Show Stable. And, as if I didn’t have enough to worry about, the temperatures had plummeted to below 50 degrees and we were guaranteed on again, off again showers throughout the weekend. Early morning alarms have become my jam lately, so I was bright-eyed and bushy-tailed this morning when we arrived at the barn. In the back of my head, there was a growing sense of dread. The weather was definitely going to impact the jump field and my horse, plus I knew eyes were going to be on me. After last year’s entertaining clinic outcome I have had countless people reach out to me with words of encouragement and in anticipation of reading this year’s recap. No pressure or anything. So Ty and I made our way down the field on this misty morning with our game faces on. There was nothing I could do about the weather, so I just had to make the best with what I had and show George how hard I had been working. The clinic started off with getting our horses prepared on the flat. We worked on lateral movements and collecting versus lengthening depending on the landscape of where we were. The beautiful thing about riding at Altamontè is getting to use their gorgeous jump field. The rolling terrain and wide open space give you plenty of opportunities to shine … or maybe not so much. Ty was very good on the flat, so much so that George opted to make him his first ride of the clinic which was very exciting. George’s big emphasis for our group was the way in which we carry our hands and how we should lift them to get the horse to come back to us. And then it was time to jump. The courses for today were very fair, in my opinion. We started out jumping up a bank, one stride to a small vertical at the crest of the hill, followed by a two stride down the hill to another small vertical. George asked for Ty and me to go first, so I rode up a little on the assertive side to start the day off right. Thankfully, Ty had no qualms with the questions I asked of him today and took to the exercise beautifully. We have some homework to polish up on in regards to coming to a halt after a fence, but all-in-all he was a good boy. As the ride continued, the rain morphed from a sprinkle to a noticeable drizzle. It was cold, we were wet and there was still work to be done. After conquering the bank, we moved on to jumping another exercise made up of a vertical down to a ditch in a grob and then back up to an oxer. Several horses were concerned by the bank earlier in the morning and George really laid into our group to let us know that it was our job to use our sticks and build confidence in our horses. I waited until George looked away to break out into a huge grin. That was all I needed to get me through the rest of the day. We continued to jump around over natural obstacles such as a hogsback and other man-made fences like an in-and-out and the infamous ASPCA Maclay wall. 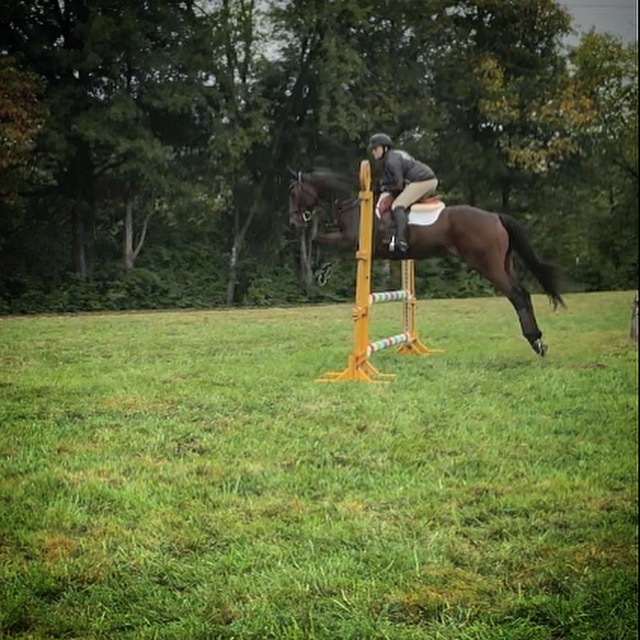 Ty jumped quite nicely around the course as I figured out how I wanted to navigate each jump. I am still perfecting my eye to find the best distance, but I was very proud that I wasn’t rushing to the base of each fence in a desperate attempt to find it (a horrible habit that took a while for me to break). Our last exercise was a simple vertical with a grassy-topped stone wall as filler placed right in the middle of a long decline. The goal was to gallop down to the fence, find the distance and stay forward, off of the horses back. He did not want to see anyone making contact with their seat, so I stretched up and tall and let Ty stretch his legs a bit. Once the group had galloped down to it, we made our way back one-at-a-time galloping up to it. Our rides had to change based on if we were going up or down, which I found really entertaining. Not every one of my distances was perfect, but I was so pleased that the day had gone on and I was still in the saddle. “Meagan, sir. I rode the big bay. I rode with you last year. I kinda sorta fell off and wound up with stitches,” I replied. I nodded my head, unsure of how this conversation was going to turn out. That comment made all of the early mornings, the late nights, the long hours, the miles on the road and countless bottles of Aleve worth it. Want to read how the rest of the clinic finished out for Meagan? Her recaps on day 2 and day 3 are live on our sister site, Jumper Nation!